After the flurry of back-to-school activities die down and we step into our daily routines the colors of the trees start to change, the air turns cooler, and the days become shorter. Fall arrives with the memory making events of the Halloween season. Halloween is gaining in popularity every year with its spooky fun capturing our hearts and imaginations. According to the National Retail Federation, Americans will spend $6.9 billion in total on Halloween. 44.8% of Halloween shoppers are planning on decorating their home or yard for the holiday. Here at The Magnolia Company we have the perfect way for you to greet your Fall guests and trick-or-treaters by offering you a large selection of décor in the harvest and Halloween colors of orange, burgundy, yellow, green, and brown. With so many wreaths, swags, and décor to choose from, it’s easy to get overwhelmed when trying to find that perfect decorative piece, so let us guide you in the right direction. If you are looking for something sleek, stylish, and full of Halloween style, look no further than our Pumpkin Lacquer Wreath. 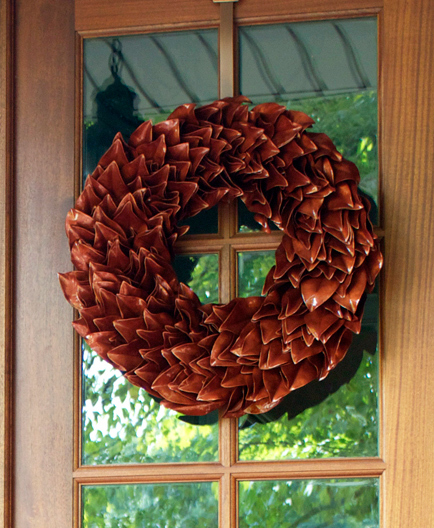 Consisting of our farm grown magnolia leaves layered beautifully to create a sweeping look, this wreath shines with its lacquered finish in a warm pumpkin inspired autumn hue making it a wonderful addition to your front door or entryway. You may want to consider pieces from our Fall Fusion Collection. 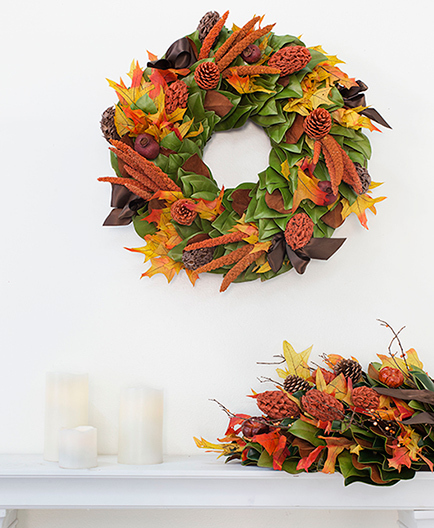 Choose from a wreath, swag, or select both, to create that ultimate harvest theme. Full of Fall color and textures, these pieces pay homage to the memories we already have and add to them the ones we will be making this year. Perfectly whimsical. 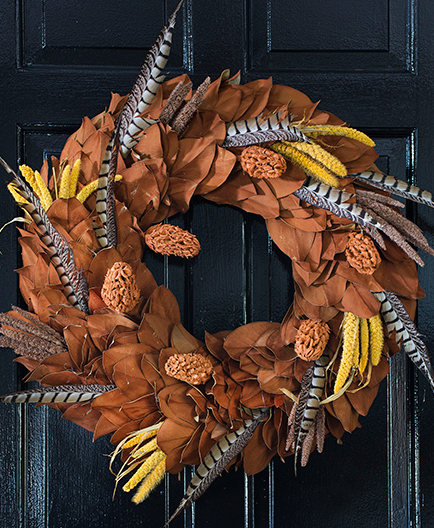 Showcasing a special flair, our Copper Feather Wreath has a warm and inviting look that will bring your Halloween décor to a new level of sophistication. Placed on the front door or inside on the mantle, this piece pops when tied together with pumpkins or gourds accompanying it. The feathered accents woven through this wreath make a beautifully bewitching accent piece that you will cherish. For Halloween don’t simply pick out your costume and await the day. Celebrate all month long! Decorate your home with the beautiful accent pieces you can only find at The Magnolia Company.